DIRECTV Residential Experience. The name says it all. It’s a simple idea… DIRECTV service in your hotel room. If you liked it at home, you’ll like it on the road. It’s not a simulation of DIRECTV service, it’s actually the same hardware, modified for the hotel. If you know the channel numbers you like at home, you’ll know them on the road too. If you know which buttons to push, they work the same as home. You even get parental controls. If you’re over 30, you remember when watching TV in a hotel was fun. Hotels actually used to advertise the TV as part of the experience! Look at this classic sign… going to a hotel meant good TV and they wanted you to know it! Color TVs in hotels were popular when people didn’t have them at home, and back in the 1980s kids couldn’t wait to get to a hotel for a taste of HBO. By the 1990s everyone had dozens of channels and by the 2000s everyone had hundreds. Hotels weren’t keeping up. It got worse when high definition started coming in, because the cost to convert hotel systems to HD can run into the 5 figures, not to mention of course the cost of the TVs. As hotels tend to get renovated every 7-10 years, it’s taken a long time for hotels to catch up to where the rest of us were in 2009. DIRECTV Residential Experience, or DRE, changes everything. Yes, it does take additional wiring. Yes it does take additional hardware. But, more hotels are seeing the benefit of adding in-room entertainment that’s more modern than just an old 19″ tube TV. Not only that, adding high-quality TV options can actually cut the demand for bandwidth in the hotel; people have gotten accustomed to having poor-quality TV options in the room and more and more they rely on services like Netflix for entertainment. The cost of keeping hundreds of high-bandwidth IPTV streams flowing isn’t exactly peanuts either. Why is it so hard for hotels? In order to understand why it’s so hard, you need to understand what hotels do now, in order to get TV to your room. It’s called a MATV (or SMATV if it’s satellite) system. The signal from an antenna comes into a master closet. 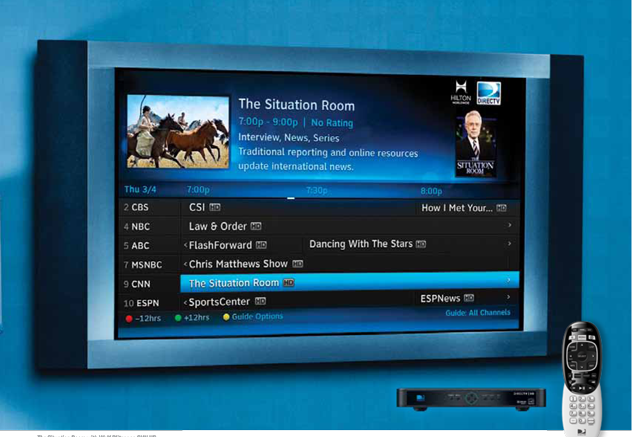 For every channel you want your guests to see, you need a modulator. This modulator is essentially a TV tuner that stays tuned to one channel all the time, then outputs it so it can share a cable with other channels. That’s right, you need a separate one of these for EVERY channel you want to offer. Want to know why you have 10 channels? Because modulators are expensive. In fact, HD modulators are ridiculously expensive, because they not only receive the signal, they have to encrypt it again so no one steals it. DIRECTV made waves with its COM1000 system which could take up to 24 channels of HD and send them through a single wire. But still, you need a separate card for each channel. If you were to try to duplicate the whole DIRECTV lineup you’d need 20 or 30 of these without even accounting for DIRECTV Cinema or sports channels. Not only that, you’re missing the experience. No menus, no guide, no nothing. That’s where the new DIRECTV system comes into play. You get pretty much everything you’d get at home. And now, you can even have a DVR. Yes it’s true. The new DRE 2.0 systems even let the hotel put a DVR in the room. Pause live TV, even record shows so that you can go play in the pool or attend meetings and miss nothing. Search for shows, too… you’ll find them in the same Smart Search screen you see at home. That’s what’s really amazing about this thing. Best part… when you check out the front desk can clear your recordings and get the DVR ready for the next person. DIRECTV does this by being sneaky. Instead of using a SMATV system, the DRE system is pretty much the same system you get if you have an apartment building wired for DIRECTV, plus some extra computer bits. It’s like the residential experience, because it’s built like a residential system. Pure brilliance and it makes installation and upkeep a lot easier. Of course, there are some things missing from the experience, because DIRECTV streamlines it for the hotel room. Some of the menus are hidden or just plain missing, so that people can’t mess with things that they shouldn’t. For the moment, there’s no pay-per-view, although that may change. Still, it really is the DIRECTV experience. A demo of DRE might be even a little boring. If it weren’t for the hotel logo in the menus you’d think you were at home. There are some added functions, like messages that can be sent from the front desk. There’s a remote that’s got an anti-microbial coating (a good thing) that doesn’t work with your home system (so don’t bother stealing it.) But bottom line, it’s DIRECTV. You already know everything you need to know about it. If you’re traveling, ask the hotel if they’ve got the DIRECTV Residential Experience. If you’re a hotelier, call us at Solid Signal to find out more!